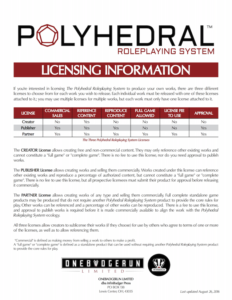 The following PDF document includes all of the information for licensing Polyhedral Roleplaying System to create your own products. As a licensee, you may use the following logos in products they are authorized for use with. The images below link to full-size high-quality 300-dpi PNG files.